The wave of 'Hindutva nationalism' seems to have moved even the comrades. The Indian Communists, who did not have much to do with the Ramayana and the Mahabharatha till now, seem to be waking up to the “great messages” inherent in the epics, thanks to the saffron tide. 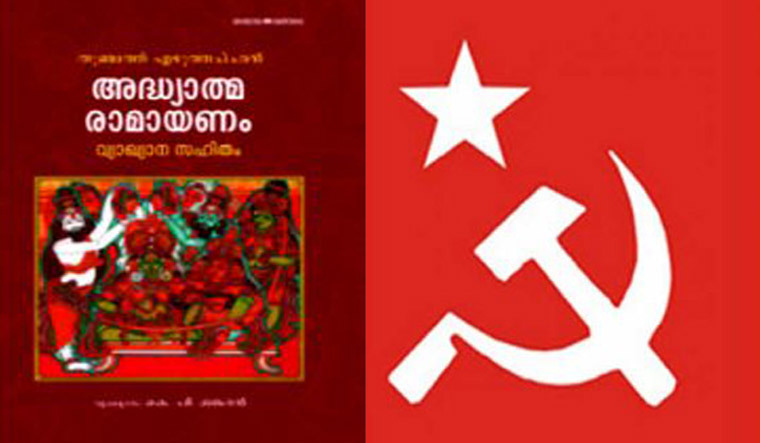 The Communist Party of India (Marxist) in Kerala has decided to foray into the terrain of the epics and interpret them in a “secular manner”. The attempt assumes political significance considering the fact that the Rashtriya Swayamsevak Sangh (RSS) has added 300 more shakhas in Kerala in last two years. The RSS has 5,300 shakhas in the state—probably the highest in the country. Even as the CPI(M) has ruled out any direct involvement in the move, Samskritha Sangham—a pro-left cultural outfit—has lined up several events for 'Karkkidakam' (July 17-August 16), the last month in the Malayalam calendar, which is traditionally observed as Ramayana month when reciting verses from the epic poem is a regular practice in many Hindu households in the state. Seminars and discussions based on various versions of the Ramayana would be conducted through the month which began on Tuesday. “The Ramayana is a world classic; not merely a religious text. It has many great messages for the common man and we are trying to pass them in a secular manner,'' T. Thilakaraj, convenor of Samkritha Sangham, told THE WEEK. The Sangham is an association of Sanskrit experts, historians and students with pro-left leanings. According to Tilakaraj, the initiative is aimed at preventing the “exploitation” of believers in the name of Lord Rama and Lord Krishna. “We can see many RSS and BJP leaders, including Prime Minister Narendra Modi, misquoting verses from the Ramayana and the Upanishads to corroborate their wrong intentions. They are exploiting unsuspicious believers by misusing the verses of these great classics. Our attempt is to contest this,'' he said. The new initiative comes three years after the CPI(M) began observing Sri Krishna Jayanti under the banner of its children’s outfit, Balasangam. There also, the party had refused its direct involvement. The Samkritha Sangham will be organising functions in all districts where eminent scholars in Sanskrit and history would be discussing various aspects of the Ramayana. Besides Ramayana classes, the programmes also include seminars, debates and conventions from village to the state-level. “We have hundreds of versions of the Ramayana, including Moppila Ramayana (Muslim Ramayana). And they all have great messages to the common man. What is wrong in interpreting them,'' he asked. The Samskritha Sangham plans to conduct similar functions to interpret the Mahabharatha and the Upanishads. A state level convention of renowned Sanskrit scholars and historians are also on the cards. But what about the allegation that the CPI(M) is playing into the hands of the RSS? “When we are planning to counter the RSS fallacies using their own weapons, how will that be playing into the hands of RSS?'' Tilakaraj asked. “Also, why do we hand over our great epics entirely to RSS? Every Indian has a right to it,'' he said. CPI(M) state secretary Kodiyeri Balakrishnan, too, took similar lines, "The Sanskrit Sangham is not conducting Ramayana recital as reported in the media. Their programme is part of a campaign to expose the Sangh Parivar’s attempt to communalise the Ramayana month and reap political dividend from it," he said. This, however, has not stopped the opponents from ridiculing the party. “The CPI(M) earlier used to ridicule the Ramayana and the Mahabharatha. Now they are glorifying the Lord (Rama) and his history. Its hypocrisy,” said BJP state general secretary K. Surendran. He alleged this only shows that the CPI(M) is panicked at the growth of the BJP in the state. May be. But it could also be a case of a much delayed acknowledgement of the Indian social and cultural realities on the part of the CPI(M). In fact, the CPI(M) is a late entrant into the land of epics and the Vedas. Its small brother, the CPI, had organised a three-day seminar—aptly called `Bharateeyam’—on traditional Indian knowledge systems, Indian philosophy and culture, Vedic and pre-Vedic periods and the Upanishads much earlier.